Practice Microbiology questions and answers for interviews, campus placements, online tests, aptitude tests, quizzes and competitive exams. This set of Microbiology Multiple Choice Questions & Answers (MCQs) focuses on “Major Characteristics of Microorganisms”. 1. For the examination of microbial cells we require the use of? Explanation: Microorganisms are very small and their size is usually expressed in micrometers. So for routine examination of microbial cells we require the use of a high-power microscope, usually at a magnification of about 1,000 diameters. 2. Lipopolysaccharide in cell walls is characteristic of? Explanation: The occurrence of lipopolysaccharide in cell walls is characteristic of Gram-negative bacteria; whereas Gram-positive bacteria have cell walls that contain teichoic acid. Fungal and algal cell walls are very different in composition from those of bacteria. 3. Which microorganism(s) among the following perform photosynthesis by utilizing light? Explanation: Cyanobacteria require light as a source of energy to perform photosynthesis. Fungi and viruses are unable to perform photosynthesis and are heterotrophic. 4. Growth of microbes in a solid media is identified by the formation of? Explanation: On solid media, microbes grow as colonies – distinct, compact masses of cells that are macroscopically visible. When microbes grow in a liquid media, the media becomes turbid and growth may either occur only as sediment at the bottom or only as a thin film or pellicle at the top. 5. Which among the following are produced by microorganisms? Explanation: Microorganisms are used in many industries for the production of food we eat, like fermented dairy products (sour cream, yogurt), as well as fermented foods as pickles, breads and alcoholic beverages. 6. What are the blood serum proteins produced by animals called? Explanation: Certain chemical compounds of microbial cells are called antigens. If microbial cells enter the animal body, the animal responds to these antigens by forming specific blood serum proteins called antibodies, which bind to the antigens. Explanation: The DNA molecule has a base composition of the following sequence as base pairs; guanine-cytosine and adenine-thymine. The ratio of A:T= the ratio of G:C.
8. The DNA of Klebsiella pneumonia has a moles % G+C content of? Explanation: The sequence of nucleotide bases in the DNA is unique for each kind of microorganism. 9. Plamids are circular DNA molecules capable of autonomous replication. Explanation: In addition to chromosomal DNA, plasmid DNA may sometimes be present in microbial cells. Plasmids are circular DNA molecules that are capable of autonomous replication within bacterial cells that contain them and their presence can confer special characteristics on the cells that contain them. 10. Bdellovibrios come under which group of microorganisms? Explanation: Bdellovibrios are bacteria which are predatory on other bacteria. They have the ability to cause diseases or are pathogenic for other microorganisms. 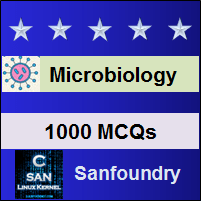 Sanfoundry Global Education & Learning Series – Microbiology. To practice all areas of Microbiology, here is complete set of 1000+ Multiple Choice Questions and Answers.